The first half of our summer holidays has gone really well so far, despite a bumpy start. The four year old assumed the holidays from school also meant we were about to hop on a plane to foreign lands and was quite put out when that didn’t turn out to be the case. He got over it soon enough, but there is no denying his enthusiasm. He chose his suitcase months ago and has had it stashed under his bed ever since. When the “week to the holiday” whistle was blown he decided it was time to pack. His brother joined in too and it was the best morning long activity of the whole summer so far. The only issue I would have with it is the content of their suitcases. Spot anything missing from their suitcases? That’s right… clothes! Who needs them, apparently! As part of this lovely linky over at Colorines Wonderful I have been inspired to share with you some tips on travelling with children. I have kept this one to the air-travel side of things! Keep it light and simple! I used to think I had the hand luggage sorted, covering every option, every food group, every recreational preference. All I really had was over packed bags and a sore shoulder from all the weight. Have you ever tried to retrieve a scattered set of colouring pencils from under the seat of a plane? This leads nicely on to the next tip, once your children are old enough GET THEM TO CARRY THEIR OWN HAND LUGGAGE! They will quickly ditch all those extras! Travel days are not the time to worry about their five a day! I used to pack all the healthy food stuff but it really just means you are trying to cover up the dried fruit and bread sticks mashed into the aeroplane seat! Once they are not filling on e-numbers and lots of fizzy drinks then its a good day to chill and ignore regular meal times and nutritional content. Don’t underestimate how long a child can take in the toilet when you really need to get moving. Try to get this business out of the way WELL before the flight even boards! I am sure there must be a mathematical formula out there proving how the speed of the child’s bodily functions is inversely proportional to the amount of time you have to dash to the boarding gate and smile sweetly at the irate air staff who have called you by name because you are THAT late! When on the plane REMEMBER TO BREATH! The more relaxed you are, the calmer your children will be… and the less likely they will be to spend the entire journey kicking the seat in front of them! If you are travelling with a baby… your entire hand luggage should only consist of spare changes of clothing. Bring three times more nappies than you can ever imagine needing. You would not believe what those altitudes can do to a child’s digestive system but you are likely to find out as well as learning how hard it is to change a baby in an aeroplane toilet! And yes, I am definitely speaking from experience on this one! Once the flight is over NEVER ask another parent how they got on! They may be in denial and make you feel even worse than you already do! Finally, once you have all the luggage collected and children corralled you can start to smile again and relax. Unless you have yet to collect the rental car; In that case we go right back to …REMEMBER TO BREATH! 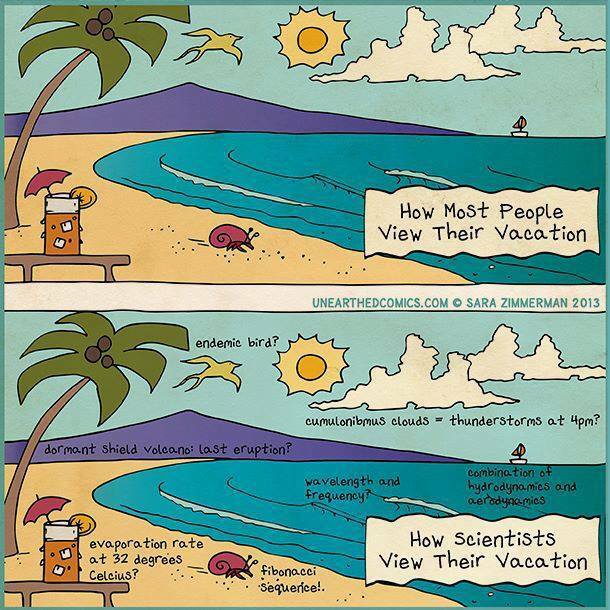 In the meantime enjoy your summer holidays, whatever you are doing or wherever you are going and I will be back here very soon to WOW you with some more scientific takes on every day life.